Your Chow is likely to enjoy spending time around the house and doesn’t care for walking that much. This breed is known for being a couch potato so watching their weight is especially important. Providing your Chow with the right food allows your pet to feel good and remain active as they age. Chow Chow’s have one of the unique personalities and appearances in the canine world. Your dog looks like a teddy bear but is probably not the cuddliest family friend to have around. These dogs originated in Northern China amongst the cold tundra, and they were typically used to hunt, herd, and pull sleds. These dogs have a reputation for being difficult to train and unfriendly to anyone they’re not familiar with. While this might be true to a certain extent, proper training and socialization can result in your Chow Chow becoming the best companion for your family. It’s essential to provide your Chow with all of the necessary nutrients it needs to grow strong and healthy. This breed does not have any specific issues that merit special feeding instructions, but any dog should always receive a balanced diet of protein, fat, and carbohydrates. Staying away from artificial dyes and coloring is vital because of their large coat their skin becomes irritated, and their fur quickly gets patchy if they scratch and bite too much. Chows have a unique body shape with many interesting features that make caring for them difficult sometimes. They have their breed-specific health issues, so let’s take a look at some of the things you should be thinking about. This breed is highly prone to overheating because of their dense coat so it’s important always to be aware of the weather and how much time your chow is spending outside. After a short period of 30 minutes outside in the warm weather your pup will most likely be ready to come back inside out of the hot weather. These dogs will also not make it very long in a hot car or outside in a pen if left alone for too long; they need shade and cold weather to be happy. Due to their abnormally small eyes and heavy skin around the area, they are prone to something called entropion. This disorder causes the eyelids to turn inwards which presses their eyelashes up against their eyes. After a while, their eyes become irritated and uncomfortable so you will find your Chow frequently scratching at their eyes. While there is nothing you can do to prevent this, proper weight management will help keep your dog lean to avoid the issue possibly. Chows are not an athletically built dog, and their awkwardly shaped joints often result in dislocations. Typically their hip joints can pop out of place during heavy activity causing incredible pain for your pet. Unfortunately, there is no way to prevent this from happening either but it’s important to understand treatments for joint issues and your pets limitations related to the ailment. The best dog food for a Chow closely resembles their natural diet. Raised in the mountains of China these dogs grew up on a high salt intake from barley, beans, and wild game. Due to the harsh climate food was typically salted and frozen so it could get preserved for years, so it’s important to give your Chow plenty of salt in their diet, so they do not succumb to calcium deficiency. Low levels of calcium cause the dog to have increased joint problems like arthritis as well as digestive issues. As with every breed of dog they should receive a delicate balance of fats and carbs as well. Having the right amount of fatty oils is great for their skin and their coat. Chows have a thick coat of fur that requires a lot of maintenance, and it looks quite beautiful if it’s healthy. You’ll find that Chows who are on an unhealthy diet of fillers and chemicals have a patchy and bland looking coat, that is one significant way to identify poor health in this breed. Lamb is your Chow’s best friend, and while it might be an acquired taste, if you can get your pet used to the flavor they’ll enjoy the healthy fats and lean protein to keep them fit. Balance out their diet with barley, oats, chickpeas, and plenty of green vegetables. We care so much for our pets, and we try hard to give them the best they can have. It’s hard financially, but it’s also hard to understand what they should and shouldn’t be eating. A lot of harmful ingredients get disguised by complicated names that no can read. Many dog foods are considered feed-grade which is lower quality than human-grade, but there is no reason you need to feed your pet by-products and meals. When something says “by-product” it typically means it came from dead animals and restaurant food waste that gets ground up into a big block and portioned out. 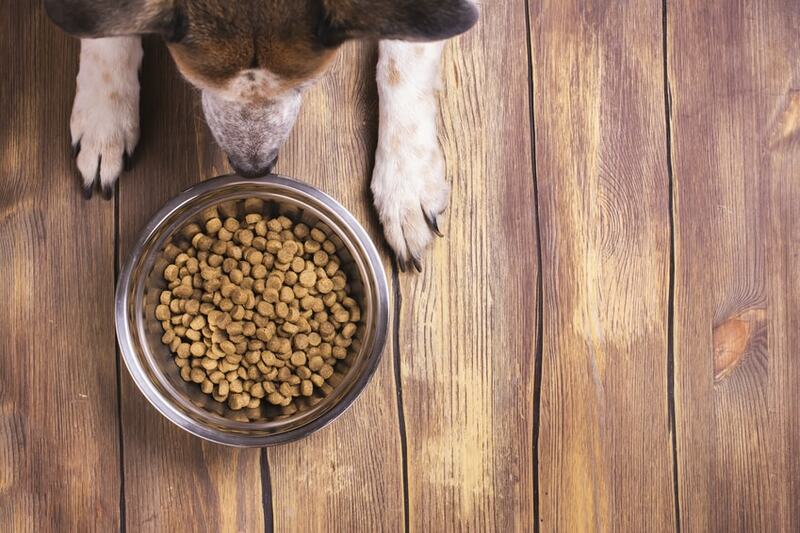 By the time this food makes it to your dog’s bowl, any nutrients get zapped out of it. The process of killing bacteria in their food requires the manufacturers to heat the food at extremely high temperatures which removes a large portion of the vitamins and minerals from the kibble. BHA and BHT are preservatives that are categorized as cancer causing carcinogens. These ingredients are commonly found in pet foods nationwide. Your Chow needs food that will nurture growth and allow it to develop correctly and unfortunately most of the manufactured foods you find on the shelf do not provide the right sources of protein, fat, and carbohydrates. Take away all the nutrients and insert chemicals, preservatives, artificial dyes, and bacteria ridden oils; what’s left is a pet you don’t even realize is sick and unhealthy. There are good brands, but there are bad brands as well, next time you’re walking down the dog food aisle keep your eyes open for these brand names and take a look at the ingredients. Retriever Chunk Dry Dog Food: The first few ingredients are ground corn, meat and bone meal, soybean meal, wheat middlings, and animal fat preserved with BHA. The primary basis of this food contains absolutely no nutritional value, and the food gets preserved with a known cancer-causing carcinogen. Plus, there are multiple coloring dyes added in for no reason at all; your Chow doesn’t care what color the food is. Kibbles N’ Bits: Let’s take a look at some of these ingredients; corn, soybean meal, beef meal, animal fat with BHA, corn syrup, and animal digest. With corn and soybean meal as the top two ingredients, you realize there is little nutritional value there for your dog. There are no whole ingredients and adding corn syrup to your dog’s food spikes up their sugar. Dad’s Dog Food: This food contains ground corn, wheat middlings, bone meal, animal fat with BHA and BHT, and added salt. The food has a crude protein of 16% and fat of 7; when you compare this to some of the leading brands, they typically have a minimum protein content of 20% and fat of 15. Because Chows were primarily vegetarians during their upbringing, they are sensitive to protein. It’s important to educate yourself and get the assistance of a licensed veterinarian to help you work out a meal plan for your pet. Here’s a little information to help you get started. Puppies: Digestion is essential for your Chow puppy, so you want to feed them small portions frequently. You can feed your pup as much as a ½ cup four times a day, so their energy stays consistent, and they have time to digest every meal. Adults: Once your Chow has grown to at least one year old you want to slightly increase the amount of food they eat but base that decision off their level of activity. This breed is sedentary so 2-2.5 cups a day should be fine for most dogs. Seniors: Quality over quantity is the slogan for your Chow, you don’t need to make too many adjustments to their eating habits as they age, but you want to pay close attention to what you’re feeding your dog to make sure they live a long and happy life. Of course, as your Chow ages, he or she will become even less active so you can limit their feedings to no more than twice a day. Balance out your Chow’s diet with plenty of fat, carbs, and protein, so your pup continues to live a healthy life as it ages. Controlling your pets’ weight and skin health are some of the most important things you can do so let’s look at our review of the best dog foods for Chow Chows. Zignature uses only the best whole ingredients in their food, and the primary item in this one is lamb. Lamb is especially great for Chow’s because they need more healthy fat and less protein, and they’ll get that perfect balance with this food. The company limits things like corn, wheat, and soy and replacing those with real meat, chickpeas, and healthy oils. Zignature believes research and education are the keys to crafting the ideal dog food. They get all their information from nature and try to make sure their food closely resembles what the dog ate in its natural upbringing. Real meat, real vegetables, and whole grains make up Blue Buffalo’s food, and they stand by their promise to provide nothing but healthy ingredients for your feline friend. The food gets enhanced with something they call “LifeSource Bits,” these contain seven antioxidant-rich ingredients for immune system health and added vitamins. The food also contains Glucosamine which is excellent for your Chow’s unique joint issues. Blue Buffalo is well known and popular with many families across the country. Their food mission started with caring for their tough pup who had a lot of health issues; they believed it was possible to make affordable dog food containing only the best ingredients. They even named their company after their pup, Blue. The name suits your Chow perfectly, and this all-natural blend from NomNomNow contains human-grade ingredients prepared in a way that would make it entirely edible for human consumption. The food contains no added fillers, no by-products, no sweeteners, and no preservatives. This company uses only the freshest ingredients, and their preparation of the food is next to none. Each batch is carefully created and prepared alongside staff veterinarians to ensure your pet gets the best of every ingredient. Your Chow pup requires specific nutrition to grow up big and strong, so it’s important to understand the necessary ingredients they need to consume every day to stay healthy. Chow puppies need a strict diet because their bodies are not cut out for excessive protein, they prefer more fat to support their digestion and skin. Taste of the Wild contains all-natural ingredients with buffalo and bison being some of the first ingredients; this food has all the vitamins and minerals they need for their brain development as well as their physical health. Taste of the Wild has state of the art facilities all over the USA, and they hold some of the highest nutritional standards in the pet food industry. All their recipes are grain-free, and they only use premium and properly sourced meats to satisfy your pets natural cravings. This stew contains some of the best ingredients available with turkey, chicken, duck and fresh cut vegetables. Blended in are some apples to help balance out the fiber and minerals in the food. There are no additives or fillers which is common in wet food. Instead, they use only chicken broth to give the food its stew-like texture. Merrick stands by your pets need for whole foods, so they vow to only include the best ingredients in their food, and they have for more than 25 years. Their food is built to fuel your pets instead of only filling them up. The way you feed your senior Chow depends a lot on the individual dog. If your dog is overweight, you want to adjust their feedings as they become less active. The most important thing is to feed your companion the right food, if he or she is eating a well-balanced diet, you shouldn’t have to worry as much about portion control. We know lamb is such great meat for your Chow, so that is why it made its way onto the list again. As your pup ages, they’ll need to consume less protein, and more fat and lamb contains a lot of healthy oils to help their skin, coat, and eyes as they get older. This food contains lamb as the first ingredient and Nutro always believes in keeping the list of ingredients small to make everything easier to understand for the consumer. Nutro has been crafting high-quality pet food since 1926, and they have no intention of changing their strategy. They believe in creating food that tastes great and helps your pets live long and healthy lives. Blue Buffalo has a strong reputation for crafting food that appeals to every type of dog at every stage of their life. The life protection blend contains seven essential antioxidant-rich ingredients as well as real meat, whole grains, and plenty of vegetables. Blue Buffalo started with their pup named Blue; they wanted to make sure their companion had the best food possible, and they wanted to make it affordable for families all over the world. Now they are an industry leader in creating the best dog food for the best dog owners. Everyone knows you want to feed your Chow the best food you can, and it doesn’t have to cost you an arm and a leg. There are many options out there for people on every size budget. Try some of the food listed above and watch how you transform the lives of your furry friends.